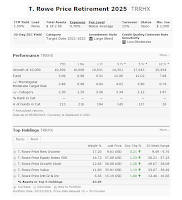 T Rowe Price Retirement 2025 Fund (TRRHX) is a popular target date mutual fund. This balanced fund invests in a diversified portfolio of other T. Rowe Price stock and bond funds. It may invest in various asset classes and sectors. This T Rowe Price Retirement 2025 Fund is managed based on the specific retirement year (target date 2025) included in its name and assumes a retirement age of 65. It may provide yield for income. This target date 2021-2025 fund has total net assets of $17 billion. The dividend yield is 1.504%. This balanced fund is ranked with 5-stars and gold rating by Morningstar. It has a low portfolio turnover rate of 12%. This mutual fund is also known as fund of funds. You can buy this mutual fund from your brokerages. The initial funding is $2,500. The asset allocation as of 2015 is Stocks (45%), Bonds (25%) and non US Stocks (23%). The allocations to underlying funds are T. Rowe Price New Income fund, T. Rowe Price Equity Index 500 fund, T. Rowe Price Growth Stock fund, T. Rowe Price Value fund, and T. Rowe Price International Growth & Income fund. According to the fund prospectus, the primary investment risks are stock market risk, country/ regional risk, currency risk, interest rate risk, income risk, credit risk, call risk, prepayment risk, asset allocation risk, etc. You can diversify by using only one fund for your retirement account. 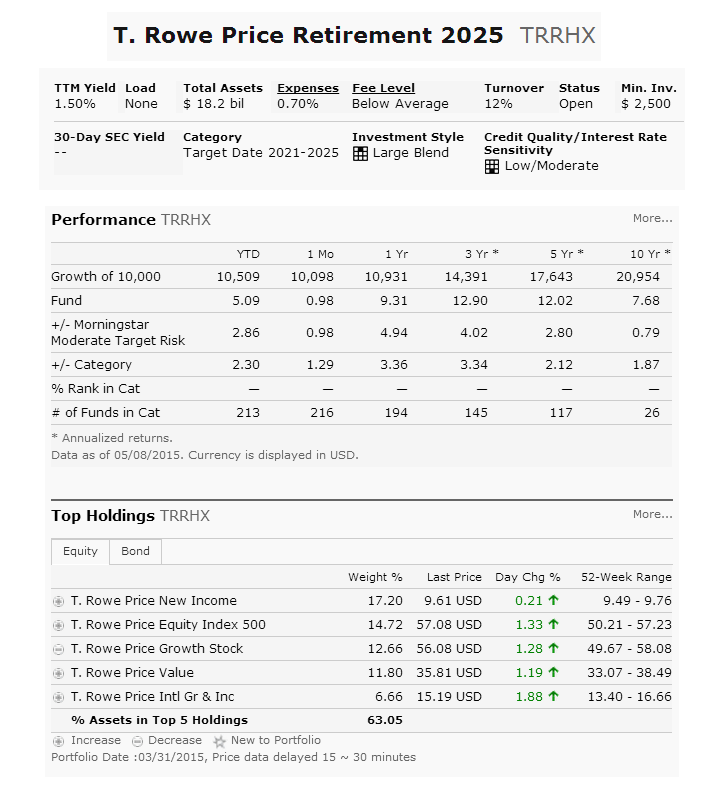 This T. Rowe Price Retirement 2025 fund may provide income through its yield. Expense fee is slightly higher for target date fund.